Offering you a complete choice of products which include paper cutting machine. Being one of the reputed organizations in the market, we are engaged in manufacturing, exporting and supplying a quality assured range of Paper Cutting Machine. In line with the set industry norms, this machine is manufactured using the optimum quality components and innovative technology. 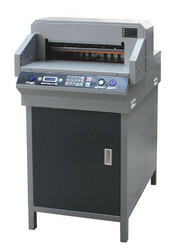 This machine is used for cutting the various types of papers with the help of programmer unit. Our quality experts also test this machine on different quality parameters to ensure its flawless functionality. Looking for Guillotine Cutter Machine for Offices ?